Sound effects, music, getting ready for a demo release, and even some gameplay footage in this update of Anodyne, a 2D Zelda-style adventure. Hello, and welcome to Anodyne news updates for 9-4-12. Anodyne is Jon Kittaka and I (Sean Hogan/seagaia)'s attempt to bring an aesthetically strong Zelda-like adventure to a Desktop environment. If you like Anodyne, don't forget to give us a vote over at the Greenlight page. I've been working a lot on sound effects and music this week, once again getting close with my DAW of choice, REAPER. Making sound effects can be fun, but requires some planning ahead. It's very easy to get caught up in tweaking too many parameters and end up getting lost in a world of sound. Before you know it, it's 30 minutes later, and you've got nothing. My workflow tends to be sitting for a bit, trying to imagine what I want the sound to be, and seeing if it fits with the visuals in the game and the general aesthetic. When I have something in my head, then I try to make it with the sound palettes I've been using in Anodyne. Most things tend to work, but I of course want to avoid very 8-bit sounds or overly hi-fi sounds, as those would not fit with the graphics or music. Then, I try the sound out in game, tweak how loud it is, and if it's good enough, it stays. I also have been working a little bit on the music, hashing out more ideas. There are only about 4 or 5 places where I still need some rough ideas for the songs, but the rest of the places just need time for me to go in and finish/work through making the song. I'm quite excited to finish Anodyne's soundtrack, as it will be my first full-fledged musical release, probably clocking in at 40-50 minutes! Pretty neat experience for me. For this news post, I decided to link to something I'm working on at the moment. It's a calm piece that's supposed to be a bit of a reprieve before you enter a more oppressive area. I'll replace this WIP with a finished version later, but enjoy this for now. Jon's been polishing up some tilesets and sprites, and we are now starting to fix up the intro parts of the game. Our goal is to have a polished demo out within the week. It will still have a set of intro areas, but additionally will have the menu systems, story, and a few other small details. Menu systems aren't particularly fun to program, but they are very satisfying when finished. We think the menu in Anodyne is pretty clean and straightforward, but you all will be the judges! When we finish the demo, we'll let you all know, so that you can try it. There's a bit of work to be done. There's been a ton of other things as well, but they're mostly under-the-hood - bug fixes, tiny visual fixes, tiny gameplay tweaks - that will hopefully make the game better. We were also fortunate enough for Joshua O'Neal to make a video of some gameplay footage from Anodyne. The video includes a lot of what will be in the demo version, minus important things such as menus, maps, checkpoints, story, and more. That's what we're working on! And that's about all I have to say for now. By looking at rough progress bars compared to our 8-23 news post, I'd say most of the work lies in finishing up NPC dialogue, the outside-of-dungeon areas, and the sound effects. Our work is cut out for us, so we just need to keep executing! Phew! Make sure to follow me (Sean - @seagaia2) on Twitter for random updates, as well as Jon (@jonathankittaka). And give the Anodyne game Twitter account a follow @anodynegame, and vote for us at the Steam Greenlight page. I really like the puzzles and the way the boss works! Looks pretty nice too - really well done so far! Love the mechanics of the gameplay so far, and it looks sweet, but much too linear. I hope the final game will be somewhat open and encourage exploration. Thanks! 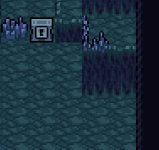 Anodyne is less linear past the tutorial and first dungeon. I needed to keep that part of the game flow linear because of the basic dungeon mechanics introduced, as well as some initial story setup. But past that, it's less linear, gameplay and story-wise.